Over-The-Top (OTT) technology, as any unmanaged network, comes at a specific price: multiplication of third-party networks, fragmented technologies, crumbled roles and responsibilities. In this situation, the difficulty to measure objectively the actual Quality delivered to End-Users with relevant KPIs or to really understand what impacts the Quality (rebuffering, content loop, black or frozen screens, etc) have become major challenges for service and content providers. They need access to proactive informed knowledge to make sound Quality improvement investments. This new delivery context requires a new approach to control the Quality being actually delivered. QoE-focused OTT Monitoring. At a glance. Witbe Technologies are genuinely User-Centric. 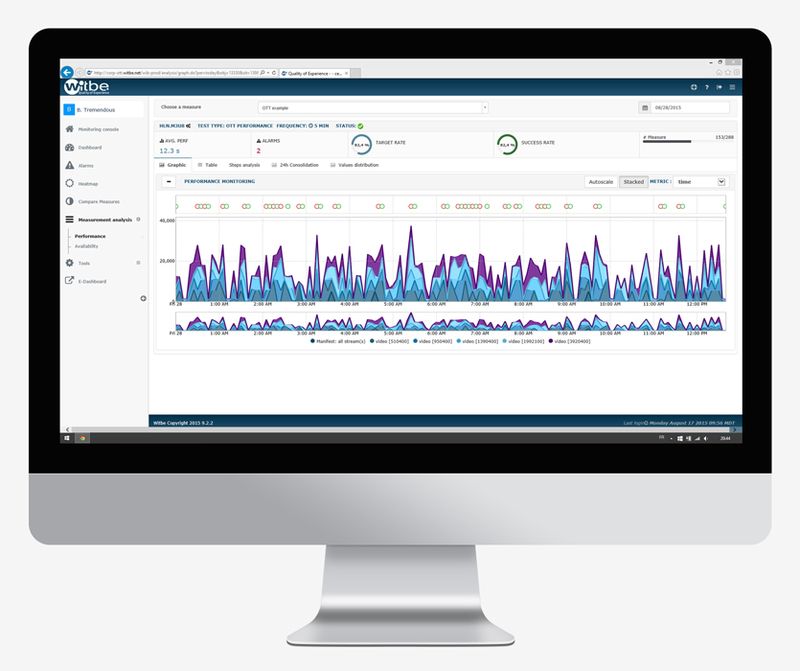 This means that the Witbe OTT Engine does not only look at OTT Monitoring from a QoS point of view: it aims at letting you know exactly what your Users experience. With Witbe OTT Monitoring, benefit from the detection of streams unavailability, rebuffering risks, loop detections, black or frozen screen detections, at all the critical nodes of your delivery chain: post-origin, post-CDN and post-device. Map the impossible, locate bottlenecks. Combine the OTT Engine with Witbe Smartping© Algorithm and locate the bottlenecks in your delivery chain (CDN, etc). This gives you the power to enforce your Service Level Agreements with third parties and improve the efficiency of your delivery infrastructure. 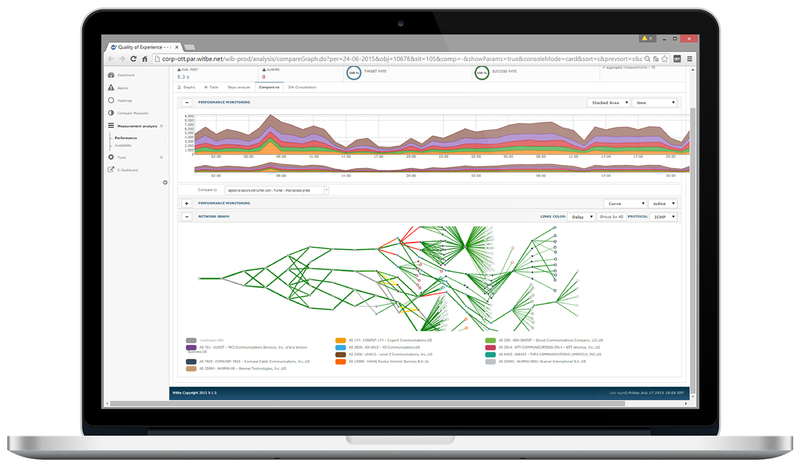 This patented technology allows you to visualize the network routes taken for service delivery, to locate the critical nodes in your infrastructure, and to analyze their impact on the quality of the service delivered. And thanks to the Witbe Portal, all this power comes in a unified and centralized Central System, fully responsive and mobile-ready. Real-time alerting made relevant: all your delivery chain on one screen. Witbe’s latest product, “Earth”, enables you to oversee the status and performance of all the critical nodes of your delivery chain, including CDNs. 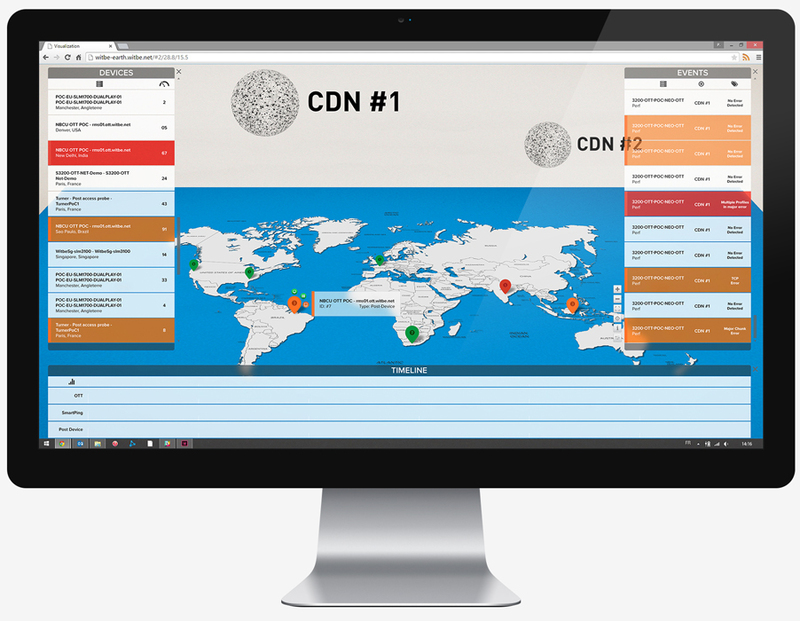 You are now alerted on the performance and availability of your OTT delivery chain around the world, from a top point-of-view, in real time and on one screen. Receive Witbe Tests events in real-time, including their result, origin and destination ; Visualize both the physical world (including the Witbe Robots) and the OTT architecture set up ; Monitor your Sample Devices’ global status, along their locations and their workloads to detect service downtime instantly ; Analyze the past and discover patterns using Earth’s Timeline, including OTT, Smartping© and Post-Device tests. Since 2000, Witbe offers an award winning approach to ensure the Quality of Experience actually being delivered to the End-Users of any interactive service (telephony, video, Web), on any device (PC, smartphone, STB), and over any type of network (fixed, mobile, OTT). Leading innovations in the QoE industry, Witbe boasts over 300 clients worldwide. Witbe has offices in Paris, New York, Montréal, Denver, London and Singapore.